I have to be honest, raspberries are my favorite food. The field behind my house growing up was full of raspberry bushes that I harvested until my little fingers were stained red. 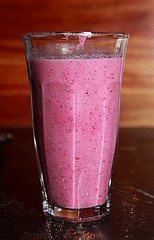 Naturally, raspberries are one of my favorite smoothie ingredients. Lucky for me, and others who love these delectable berries, they offer a lot in the way of health promoting properties. Raspberries are especially high in vitamin C and manganese, as well as being a good source of dietary fiber. The antioxidants unique to raspberries provide powerful protection, and their antioxidant activity is about 50% higher than strawberries. The phytonutrients (plant-nutrients) in raspberries also provide antimicrobial and anticarcinogenic protection. The dietary supplement, ellagic acid, found in many health stores, is usually made from red raspberries. Studies have shown that freezing raspberries doesn’t significantly affect their antioxidant activity, which is the best news ever! Some people don’t care for raspberry seeds in their smoothie. If that’s you, try blending the liquid base of your smoothie and just the raspberries first to grind those little guys up. Alternately, a high powered blender such as a Vitamix or Blendtec will reduce the seeds to a powder. Time to rock out with this raspberry smoothie! Place all the ingredients into your blender and blend for around 30-45 seconds or until desired consistency is reached. As always, comments are welcomed and encouraged. Happy Blending! This looks delicious! Thank you for putting the nutrition information in. It’s really nice to see what’s inside this smoothie. Looks great, I will try it in the morning. My favorite with raspberries is with papaya, grape and lime (and raspberries of course). I can’t wait to try this when I get home today. I do have a question, I don’t have any bananas at home so is there something I can replace it with or should I not worry about it? Either replace with avocado or simply omit the banana, Lee.